Recounting her experience, Lilly said: "There were four customers in store, and some of them shouted. The men robbers looked panicked, and thank God they ran away. "They took £150 from the till with them. £150 - was it really worth it for them?" In its report, the BRC said it would be wrong to assume that weapons were only used in the "higher-end incidents, or for very significant amounts". Lilly said she was "shaken and upset" after her ordeal. "The next time I stood on the till, thoughts of what I could have done, what I should have done, ran through my head. "I was suspicious of every man who came to the till that day, wondering could it have been them? "But you have to get over these feelings and get on with the job, you can't think like that." 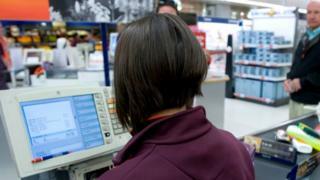 Chief executive Helen Dickinson said violence against staff remained one of the most "pressing issues" facing retailers. "Yet once again, we have seen an increase in the overall number of incidents. No one should go to work fearing threats and abuse." Respondents said knives were the "most significant" threat, followed by syringes and "hitting implements". "Guns were also concerningly high," the BRC added. About 70% said the police response to retail crime was "poor or very poor". Ms Dickinson said : "We hope this report will act as a catalyst for Police and Crime Commissioners around the country to take action. "Retail crime should be explicitly addressed by Police and Crime Plans. Furthermore, Parliament must play its part in stemming this tide of crime by creating a specific criminal offence to protect retail employees from assault at work, as has been done for emergency workers." The BRC's Retail Crime Survey also found that retailers lost £900m to all forms of crime over the course of the year and that crime prevention cost £1bn.